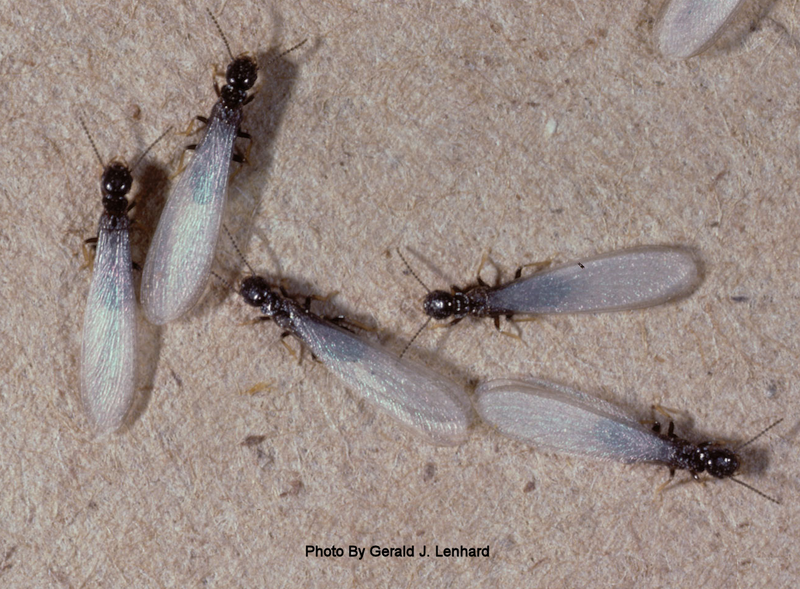 Termites are insects that live, reproduce, and thrive in large colonies. The diet of a termite is entirely wood and cellulose material. Meaning, for a homeowner, even a single termite colony can do thousands of dollars of a damage in a year. Subterranean termites live in the soil around and under homes. They make their way into the home through cracks in the walls and foundations of houses. Drywood termites nest and thrive in the wood they eat. This means that drywood termites are typically found making a bed and breakfast of a home's siding, wood trim, and even wood furniture. 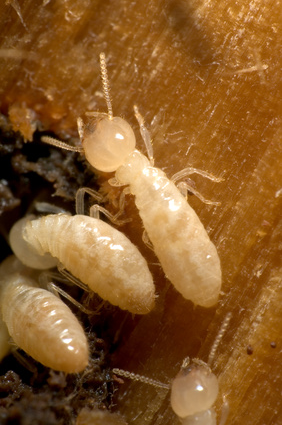 Dampwood termites, as their name suggests, make their home in damp wood. This type of damp wood is often found where the wood structures of houses meet moist soil. Risk factors that may heighten chances of an infestation are leaky pipes or other causes for water to accumulate. Just like subterranean and drywood termites, damp wood termites won't hesitate to begin nesting and eating away at your home, shed, or trees. Pictured below is the subterranean termite swarmer. These swarmers lose their wings. 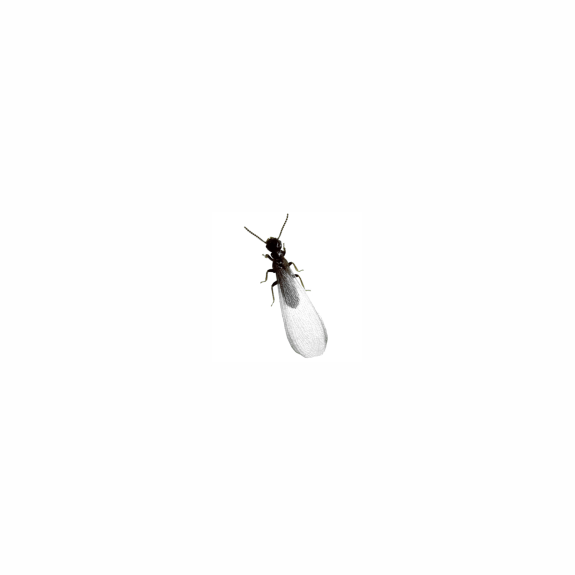 Swarms of flying ants, termites specifically have wings that break off. Mud tubes, roughly the thickness of a straw, that appear around your foundations and other structural areas. Cream-colored insects, roughly 1/8″ in size. Often found under rocks, mulch, or boards. Are you concerned you have termites in your home? Give us a call! With our knowledgeable staff (including a licensed entymologist), ready to assist in over the phone or in-person identification, completely free of charge. Once we have ascertained termites are on your property, a full inspection is done of the property. Then, an individualized treatment plan is created. We consider the problem source, materials used to build your property, local environment, and nearby structures to design an individualized plan. Once an Individualized Treatment Plan is created, and the property is surveyed, our business will give you a quote for the service free of charge. Once we have developed our individualized plan, we utilize cutting-edge Sentricon technology systems to eliminate your termite problems for good. Here at Accurate, we stand by everything we do. We are so confident in our ability to solve your termite problems on day one that if your termite problem returns, we will retreat for free for a year after your initial treatment. Concerned you may have termites? Give us a call and we will come to your home, inspect, and quote for free! Sentricon is a first-in-class termite baiting system that delivers immediate and total results. The Sentricon system targets the source of the problem- the termite's queen. Without a queen, the termite colony collapses and is unable to sustain itself- completely eliminating your termite issue. Over time, liquid breaks down, leading to possible re-infestation. With Sentricon's baiting system, that worry is in the past. Sentricon bait stays viable, and creates a continuous ring of protection around your property. Still unsure about whether you have termites? Just want to talk to our experts? Interested in scheduling a free quote? Give us a call!